Offering nearly 62 ft of lake frontage on Yellow Creek lake with a 40' wood pier. 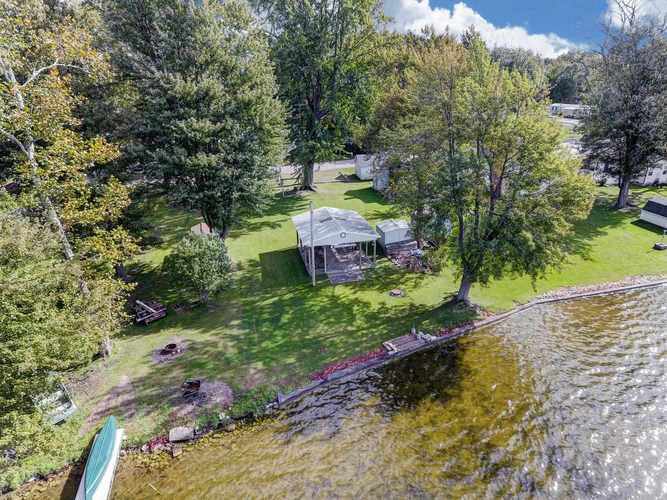 Waterfront property with picnic pavilion that measures 20x24 with electric, perfect for lake season entertainment. The ranch style home is located across the street with over 1,500 finished sq ft, three bedrooms and two baths. Ample sleeping areas and a spacious living room area with gas log fireplace and nearby kitchen and dining room. Enjoy lake views from the large living room window too! Parking areas are at the lakefront lot, home driveway and detached garages. Roof and furnace are only a few years old and most furniture is included in sale. Making this lake home ready for you! Directions:From SR 15 South, turn West CR 700 South, turn South on CR 600 W to Yellow Creek Lake.